The understatement of the week: avocados are popular. Recipes for the fruit are plastered all over Pinterest, cooking blogs and Instagram (for some serious toast envy, check out the Instagram handle @toastsforall, which has 41.6K followers). Avocado toast has even infiltrated restaurant menus across the United States. It’s easy to prepare, ultra-tasty and healthy. Fittingly, a new report released by the USDA found that fresh avocado consumption per capita spiked to 7.1 pounds in 2015 and 2016—more than double the estimate from 10 years ago. Considering that many foodies (including this one) regularly eat an entire avocado in one sitting, that figure sounds about right. Where are all of these knobby orbs of green deliciousness coming from? While California, Florida and Hawaii are domestic producers of avocados (California is responsible for about 85 percent of all avocados grown in the United States), Mexico is the chief supplier. "For more than a decade, imports have trended higher and served a dominant role in meeting the growing demand for avocados in the United States," according to the USDA report. 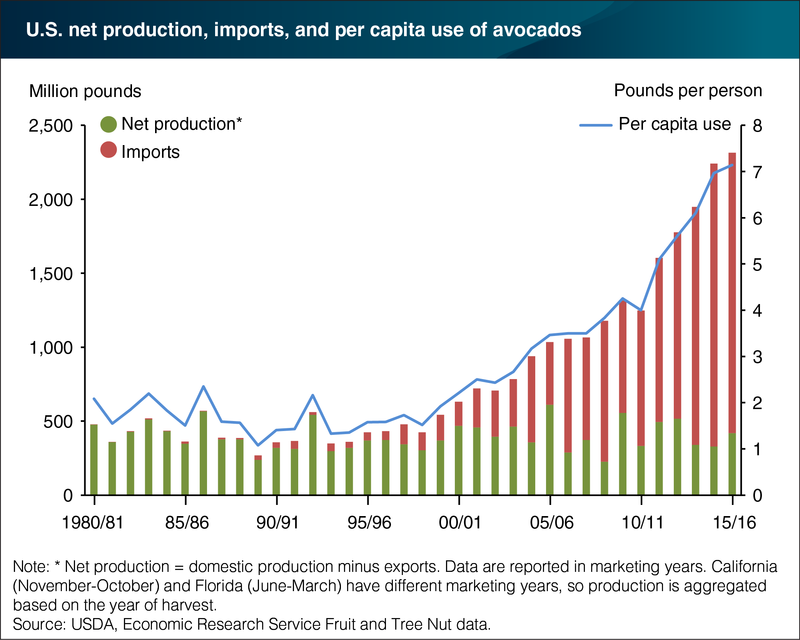 "Much of this growth in imports has been facilitated by Mexico’s year-round access to the U.S. avocado market." Mexican-grown avocados make up over 80 percent of the U.S. supply, equating to around 2 billion pounds per year. That’s a lot of avocado toast. Check out the USDA graph below to understand just how much we rely on foreign imports for this creamy, fatty fruit.